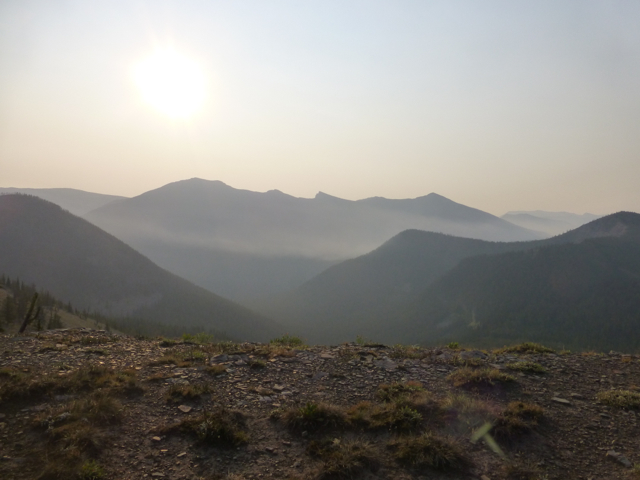 Today was the second and final day of the fire reroute in the Bob Marshall Wilderness. 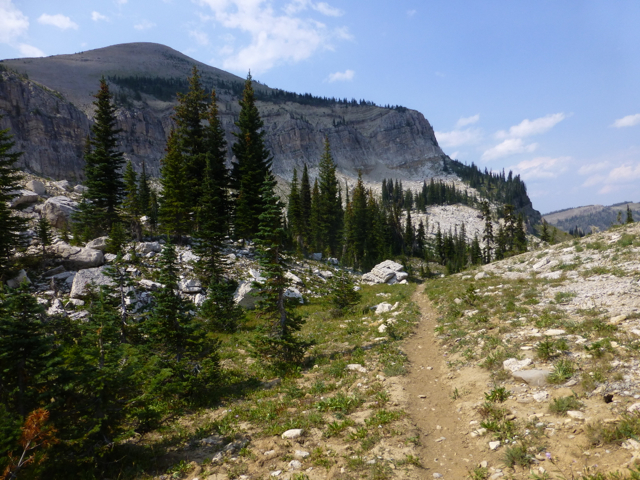 I was looking forward to it because it had us hiking just one ridge line to the west of the fires and we were going to be high enough to get some of the great views the Bob has to offer. I left a little before Bloodbath and Rampage at the leisurely time of 7:25am. I’m LOVING sleeping in! It’s been colder in the mornings and the sun has been coming up later and later each morning. The morning started off with an climb that took us around the side of Bungalow Mtn. On the way up, I could see over to the valley the fires are in. It looked pretty cool in the early morning light. I’m hoping the extended rain last night helped to slow the fire. It was definitely less hazy than it’s been, but still hazy. After a couple hours, Bloodbath and Rampage caught up to me and we hiked the rest of the day together. While on the ridge this morning, we had great views of the surrounding mountains. There was even a long rock formation that resembled the Chinese Wall, which we were unable to see because of the fires. We are calling it our own personal reroute Chinese Wall so we don’t feel so bad about missing out on the real thing. While we hiked today, we again listened to the original radio series of the BBC’s, The Hitchhiker’s Guide To The Galaxy. I think we listened to about 7hrs of the series and are now on the final episode. It has been fantastic to listen to on the trail, and has kept all three of us fully entertained! Again, thank you to David who sent me the whole series on a mini sd card I can play on my Sansa Clip. 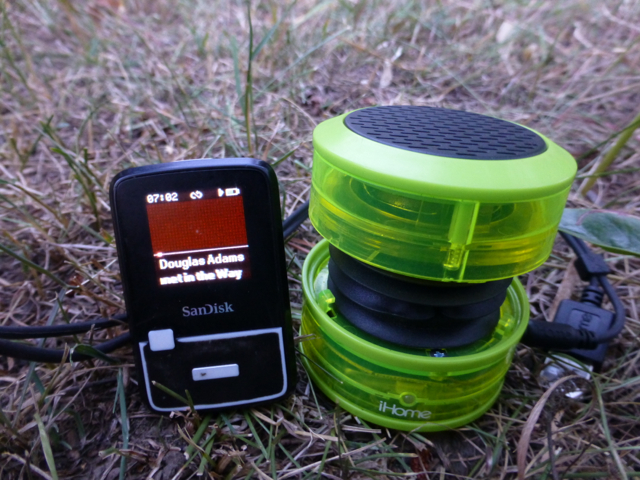 Here is the clip along with the iHome speaker(in my Wired green color!) we’ve been using. We each have a speaker and they are made to connect together, so we have been getting the series nice and loud for all three of us to hear and in surround sound. Score! With the combination of the series and the high stretches with views, the day went by pretty quickly. We have a very relaxed schedule, so Rampage and I even swam, or more like dunked, in the cold clear water of Dean Lake. We have felt really gross with all the dirt caked on us and the fact that we haven’t had a real shower in 7 days. Stream and wet wipe cleaning can only do so much and we just wanted to feel clean again. It felt great! We are guessing that the reroute is about 5-10mi shorter than the official CDT because we got much further than we thought we would today. 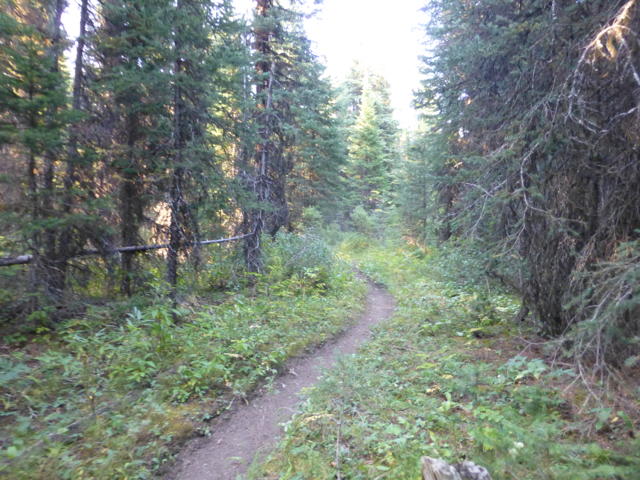 The trail has been very dense, brushy forest and we had to hike further than we had planned because there was nowhere to camp. We hiked until 6:30pm and ended up finding space near an unmanned ranger station. It’s a great spot with a running stream I can hear nearby, a beautiful view, and the luxury of eating dinner on the porch. For the rest of this leg, we have two options. We either do two 24.5mi days and then a 15mi day into E Glacier. Or we can push and do two 32mi days to have a zero in E Glacier. If we don’t do the big days, we have to camp 15mi out the last night because it’s the park boundary and there is no backcountry camping allowed other than the formal camps. We decided that we are going to keep it relaxed and do the two shorter days. Our bodies have really been enjoying the shorter days and it would just wear us out to do two big days at the end of this long leg. I’m very proud of us for holding back and I think we’ll be happier for it. 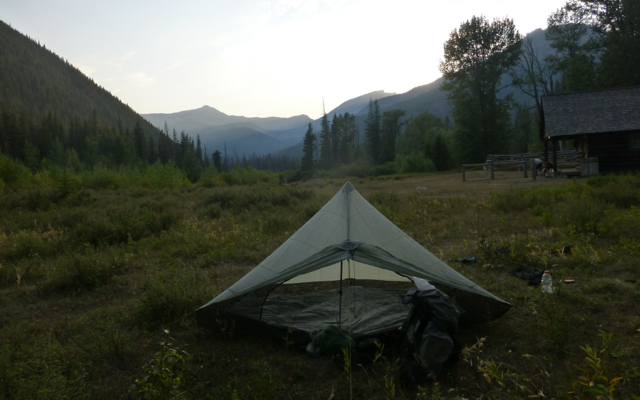 We are 1mi from reconnecting back onto the CDT and the day tomorrow looks to be a good one, yay!